The slightly-modified "Shake Light" and the "pointless"transmitter. The flashlight portion still works! The annual "Homebrew" meeting of the Utah Amateur Radio club meeting was coming up and while I was going to show off what I'd done thusfar on my mcHF transceiver - link I wanted something else that was a bit more "fun" and a very quick build, preferably one that could also give a signal to hear on the transceiver at the same time. After a bit of brainstorming, something simple and pointless occurred to me - the so-named 10 meter DSB (Double SideBand) QRP transmitter in the title of this article. I'm not sure where the idea came from but the germ was, no doubt, related to a previous article in this blog, "A Mechanically-powered Capacitor Flashlight" (May 13, 2012) - link where I describe the inner-workings of the "shake lights" that were the objects of the annoying commercials that had been playing at the time. These commercials have (thankfully!) disappeared from TV and the flashlights largely gone from the stores, but I bought several of them on clearance a few years ago. As noted in the article linked above, while these particular flashlights actually do have electronics in them that will generate electricity in response to mechanical motion, not all of them do as some are apparently electrically inert, being marked as a "Toy" as the article "What Light Through Yonder Flashlight Shakes - Link describes. The flashlights that I got on surplus aren't as good as the somewhat expensive ones mentioned in the article above, but I was curious how well they might power a simple, low-power transmitter. The transmitter itself is very simple and is depicted in Figure 2, below. The diagram of the "Pointless" 10 Meter QRP DSB Transmitter. C4 is connected directly in parallel with the 0.22 Farad capacitor already inside the "Shake Light" which means that the flashlight's "run" time is also increased! If a 50 ohm "antenna" load is used instead of the telescoping antenna, the 3.9uH inductor would be omitted. On U1, pins 1, 2, and 3 are connected as shown with the remainder being grounded. No attempt at low-pass filtering was included, so caveat emptor! 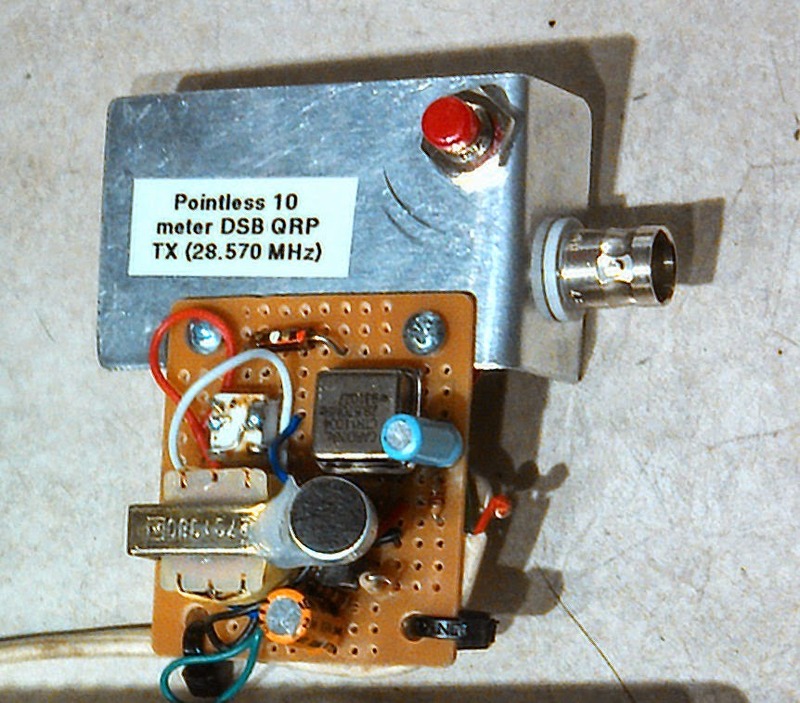 This transmitter is almost as simple as it could be! The RF energy comes from a 28.570 MHz crystal oscillator module that I found in my box of "Crystals and oscillator modules." At 5 volts it consumes 5-6 milliamps and it seemed to function down to about 3 volts. I picked this frequency because it was in an amateur band on a frequency where SSB (or "DSB", in this case) was legal. The fact that it was 10 meters was a plus since that made the antenna a bit more efficient. In testing other oscillators, I noted that some drew over 20 mA, so I stuck with the lowest-power device that I found. U1 is a doubly-balanced mixer that I pulled from a piece of scrapped satellite equipment. T1 is a 1k-to-8 ohm transformer from Radio Shack, part number 273-1380, but about any similar impedance transformer would probably work. The Microphone is a standard electret microphone available about anywhere. I think that it came from a junked telephone handset, but I'm not sure. 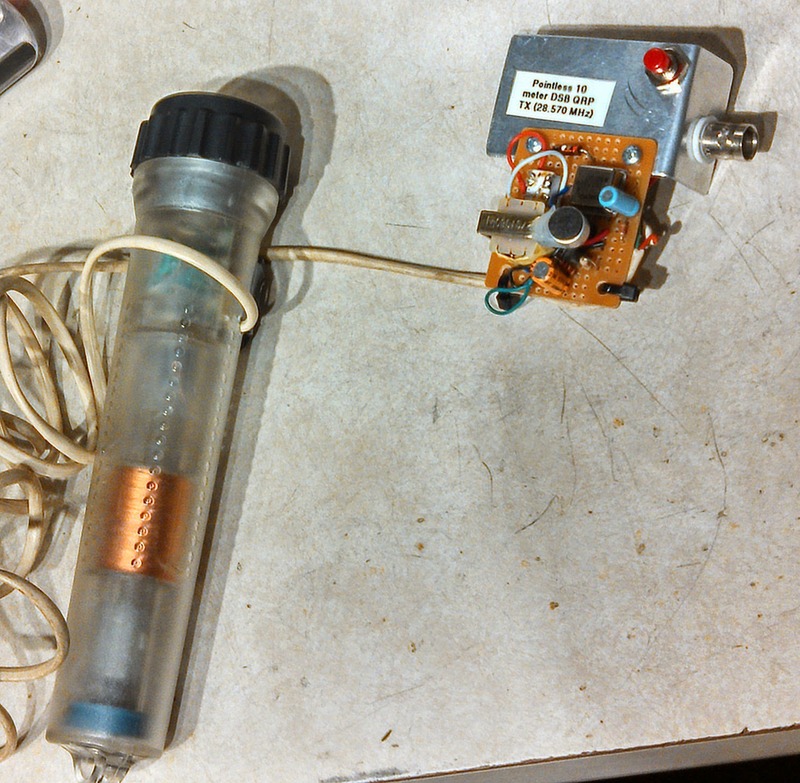 The 1 Farad, 5.5 volt capacitor came from a junked piece of computer equipment that had used it for a memory backup power source. Some telephone cord - the sort with embedded cloth woven in - used to connect the flashlight to the transmitter. This cord is very lightweight and able to flex repeatedly without fatiguing and breaking - plus it was free, having been cut from a junked telephone handset. The "Q1" microphone amplifier circuit consisting of all of three components (not counting the coupling capacitors) to boost the audio. Assuming that capacitor C4 is already charged up to something around 5 volts, pressing switch SW applies power to the oscillator, the microphone, and microphone amplifier, Q1. Q1 boosts the audio from the microphone by a factor of about 100 or so and transformer and T1 converts the rather high impedance from the amplifier down to something closer to the 10's of ohms that U1, the mixer, wants to see on its diodes. Click on the image for a larger verion. When current from the audio transformer upsets the diodes in U1, the mixer, it gets out of balance and RF gets through: The more out-of-balance from the higher audio level, the more RF gets through. Interestingly, if the audio goes positive, the phase of the RF goes one way, but if the audio goes negative, the phase of the RF goes the other way, providing symmetry in both amplitude and phase. In the process it generates "Double Sideband" (DSB) which is the same as single sideband except that both USB and LSB are generated at the same time. The output of the mixer goes through L1 which, in this case, is a 3.9 uH choke. For this device I used a telescoping whip about 26.5 inches (67.3 cm) long and this amount of inductance "approximately" resonates it at this frequency - very approximately, but better than if I'd just fed the output of the mixer directly to the whip! The RF output power has not been measured, but it is likely on the order of 1-2 milliwatts PEP, at most! It is difficult to tell from the picture in Figure 3, but the entirety of the plastic-bodied BNC antenna connector is actually insulated from the grounded aluminum bracket to which it is mounted and both its "shield" and center are connected together. This allowed me to "bypass" any matching network on an antenna that I might try and use the telescoping whip antenna that I'd happened to grab from my box of VHF/UHF whip antennas. It was observed that the addition of the 3.9uH inductance added to the range when using the whip: If you were to connect the BNC connector to a 50 ohm load (e.g. an antenna that was already resonant) then the shell of the BNC connector would be grounded and 3.9uH inductor would be omitted. Note that there is no low-pass filter anywhere on this design - other than the very slight effect of L1 - so caveat emptor! When I used the RMS-11X mixer - which is surface-mount - you'll see from careful scrutiny of Figure 4 that I used tinned (#26 AWG) hookup wire to mount it upside-down ("dead bug") on the prototype board, bridging the three common "ground" connections and taking them to the bottom of the board along with the other three connections, namely the LO (Local Oscillator), RF (typically the signal input or output) and the IF. As is typical I connected the "LO" port of the mixer to the crystal oscillator via C3, the capacitor being used to block the DC component of the oscillator and reduce the current consumption since it is a DC short and the output of that oscillator is a square wave with a DC component. Meanwhile, the mixer's "RF" port was connected to the antenna with the "IF" port going to transformer T1 as the audio source. I was, however, surprised when I got no modulation at all and decided to investigate. of it, just above the transformer. Typically, these doubly-balanced mixers are connected such that the connections to the diode "ring" inside of them are brought out via the "IF" port - which makes since since, in many cases, the "IF" can include audio - or even DC - but when I measured the "IF" port I found a DC "short". Re-checking the data sheet, I verified that I'd not messed up the pin-out - something easy to do when you are using a device upside-down - but then I remembered something in the back of my mind from a previous time that I'd used one of these RMS-11X mixers: Checking another connection, I found the tell-tale (approximately) 0.225 volt bi-directional "Shottky" diode drop on the "RF" pin instead - something that I'd apparently noticed in the past, but only dimly just remembered! Why the data sheet shows the connection in the what that it does is beyond me. Perhaps it is an error, but it could also be because the "RF" port is sometimes so-designated because it may that which that has the greatest amount of isolation to the "LO" port over most of the frequency range of the device - a fact implicitly bolstered by the fact that "DC" is not included in the "official" frequency range of any of this mixer's ports. Swapping the positions of the "antenna" and "audio" leads was easy enough and upon doing so I suddenly had modulation, but not very much, so I added the Q1 amplifier, a simple common-emitter, self-biasing design that draws around a milliamp, but provides a lot of gain: Now, instead of having to yell at the transmitter to drive it into clipping and not get much power, I can talk fairly quietly, up-close, drive it into clipping, and not get much power! As noted in the May 2012 blog post, the only reason that these "shake lights" were usable by the consumer at all was that they actually contained a pair of lithium coin cells! If you removed those coin cells, the magnet and coil assembly did actually work to provide power, but it took a few minutes of shaking to bring the voltage from zero up to the 2.4 volt or so just to get the LED in the original flashlight to shine very dimly - and another couple of minutes to get enough charge before it would shine brightly for, perhaps, a few 10's of seconds. Even though this entire circuit drew less than 10 milliamps I noted that it dragged the original 0.22 Farad capacitor from a 5 volt charge (provided by an external power supply) instantly down to about 2.25 volts due to its internal resistance, requiring the addition of C4, a physically-larger capacitor with much lower internal resistance. Dropping only about 0.15 volts under load, this meant that not only would I get better run time, but charging would likely be a bit more efficient since less power would be lost in resistance within the capacitor itself. How long does it take to charge the entire thing from zero volts? I'll admit that I've never run this completely down and then tried to charge it up again using the shake light (I'm not a teenager anymore!) but I did do a bit of experimentation and have determined that for every 5 seconds of talking, it takes about 60 seconds of shaking to restore that amount of charge on the capacitor, once it it has already been charged to 4-5 volts. Based on those numbers it would probably take at least 15 minutes of vigorous shaking with a completely discharged capacitor before one would start to get usable results! Is this transmitter, powered by a "shake light" practical? If you wanted a means of mechanically powering low-power transmitter (or even a transceiver!) - one that could produce much power power than this - you would be far better-off using one of those crank-powered flashlights and scavenging power from its mechanically superior means of energy production, instead! 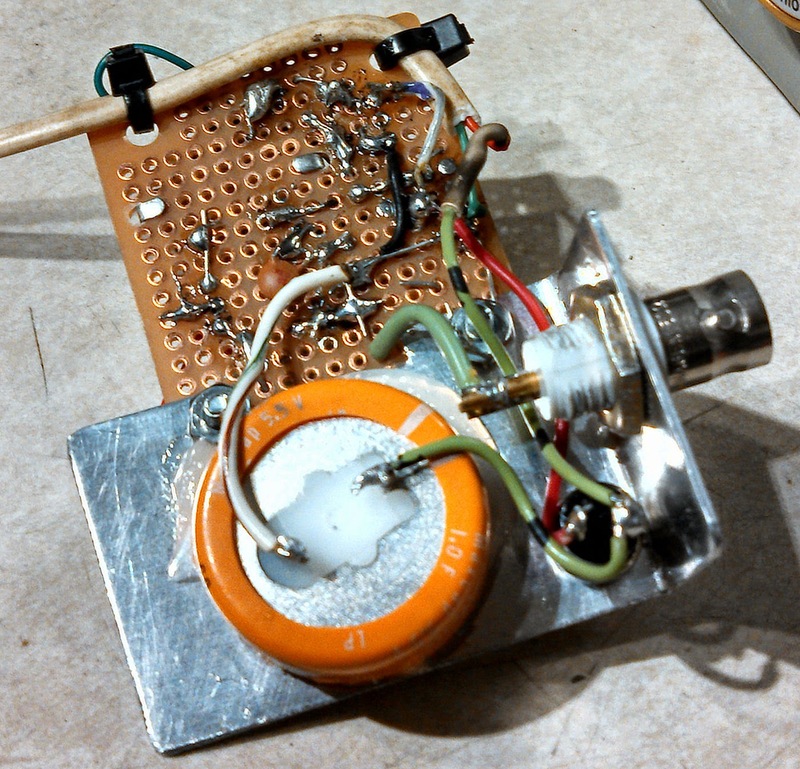 This transmitter project was built in just a couple of hours in a single evening using parts entirely from my junk box: The only part that I had to buy (but I had on-hand, anyway) was the 1k-to-8 ohm Radio Shack audio transformer. The entire reason for building it was to demonstrate that the mcHF transceiver was capable if "hearing" a signal - and to get some laughs - at the UARC Homebrew meeting. One of these days I'll see how far it will transmit. I suspect that it will go, perhaps, a couple of thousand meters (or yards) using the whip antenna and a trailing wire for a ground/counterpoise - particularly if the antenna matching is optimized, but being that it is capable of only a few thousandths of a watt output, it will never break a DX pileup on its own! Although "different" and, perhaps a bit more current-efficient, the NE602 version would not have been "simpler"!